Violent Video Games Are Good. Who Knew? While I was largely unimpressed with the Times Magazine special on education and technology, I did find one tidbit of research really interesting. 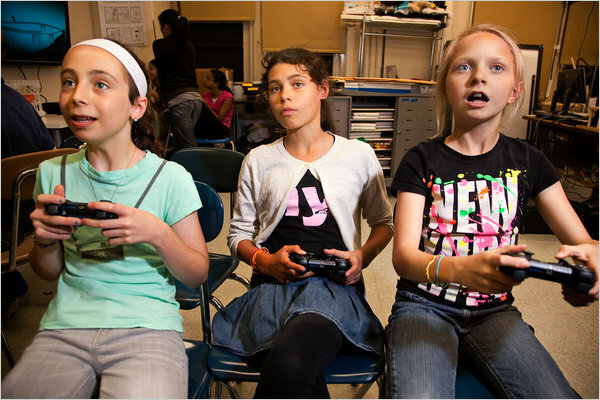 Apparently, violent video games improve visual-spacial ability, especially in girls. The benefits are long term. And, yes, the games have to be violent. Maybe we should buy that XBox 360 for the kids. In other news, the kids have figured out how to bribe researchers at the University of Toronto. I’ve read some of the video game studies (though I’m not sure I’ve read this one). The specific benefits I’m aware of require hours of practice, and result in “instinctual” improvements. I’m guessing it isn’t the violence that differentiates the “puzzle” from the other games, but the rapid “fire” action and decision making. We need to think more about how to integrate those skills into traditional girl activities. Maybe shooting with a camera instead of a bullet? You could be trying to capture a picture of the elusive blue-tailed bigfoot while other photographers and random tourists interfere? PS: I’m also wondering how they got the women to play those games. I remember the long ago days when people started playing Doom, and making me play that game would have been a Clockwork Orange experience. They’d have had to prop my eyelids open with toothpicks. Did they let you play Doom after the part where you get the chain gun? Because that was great. My fifteen year old daughter has played several FPS (First Person Shooter) games and enjoyed the challenge of visualizing where the bad guys are hiding out so that she can get the drop on them and not vice versa. In order to build my own skills in the pre-video game days, I had to content myself with playing queen of the dirt mountain, lobbing bits of mud at the other kids attempting an uphill assault. Doing it virtually would have been comfier and cleaner. It also would have gotten me in much less trouble!